Kristy and John had a very small family-only ceremony earlier this year. It was probably the most intimate ceremony I’ve been to outside of a courthouse elopement. I was lucky enough to meet up with Kristy twice before her wedding and in that time frame I learned what a strong mother she was and we bonded over similar life experiences. When I arrived Kristy was by herself in the church’s back hallway. She was getting ready in the same room they stored the choir robes and candelabras. Her mom and sister joined us shortly after and they helped her put her dress on. As I photographed her getting ready, I couldn’t stop staring, mostly because I was so excited for John to see her. Her getting ready photos ended up being some of my favorite from the shoot. I had never met John before this day, so I went and introduced myself before the ceremony. I was met with the warmest smile, a laid back personality and an excitement that never gets old no matter how many grooms I photograph. As guests arrived, they were met with a gift of a little succulent plant. Kristy and John’s two kids were both so dapper in their little tuxedos. 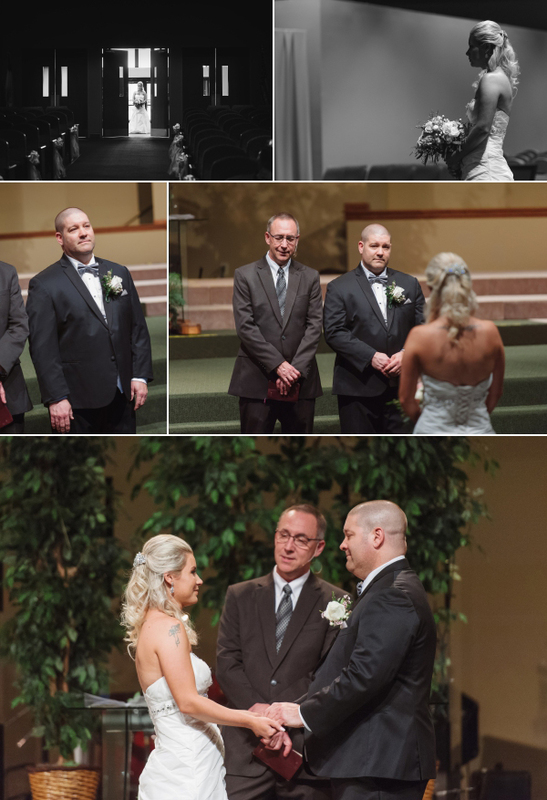 Their older son held on to their wedding rings as he walked down the aisle. The rings were affixed to John’s family Bible. John’s eyes welled up when he saw Kristy walking towards him. It was the perfect moment in time.